The site is largely artificial, originating from former gravel pits. The river gravels were of good quality and represented an important local source for the construction industry. The pits ceased to be worked in 1970’s and flooded. Ownership reverted to Ilkley District Council who in filled the lagoons in the early 1970’s (prior to the formation of CBMDC in 1974). Tipping was widely encouraged. Infill materials came from across the district. A variety of materials have been used: building rubble (including the former railway bridge from Bridge Street – parts of which are visible on the edge of the lagoon), soil and treated sewage residues Plant materials and soil from parks, gardens and building sites will have added to the sites bio-diversity. Tipping was eventually stopped. CBMDC took over ownership of the eastern site in 1974. There is a lagoon which Ilkley Angling Association lease from the council. The site is managed by the Trees & Woodland Team of the Dept of Culture, Tourism and Sport with consultative support from Countryside and Rights of Way team. The site has been well recorded by Wharfedale Naturalists Society over the years and despite their artificial origins developed considerable botanic diversity. CBMDC commissioned West Yorkshire Ecological Advisory Service now known as West Yorkshire Ecology, formerly in June 1997 and then again May 2003 to survey the site. With over 300 vascular plant species and the varied nature of the habitats helping to support good faunal diversity, the site was designated a Site of Ecological or Geological Importance (SEGI). The designation recognizes the regional importance of the site and gives it protection from development. Other CBMDC SEGI’s locallyare Middleton Woods and the River Wharfe which adjoins the site immediately to the north. The site’s biodiversity deteriorated since the 2003 survey, with an infestation of weeds in particular Himalayan Balsam and Japanese Knotweed. Bramble, hawthorn and willows have grown to the detriment of ground cover. The once extensive orchids for which the site was famous declined to a few flowering plants. The site has also lost many of the interesting “occasionals” which failed to establish themselves. Concerned by this in May 2007 WNS started to work with CBMDC developing a management plan and running regular volunteer working parties. 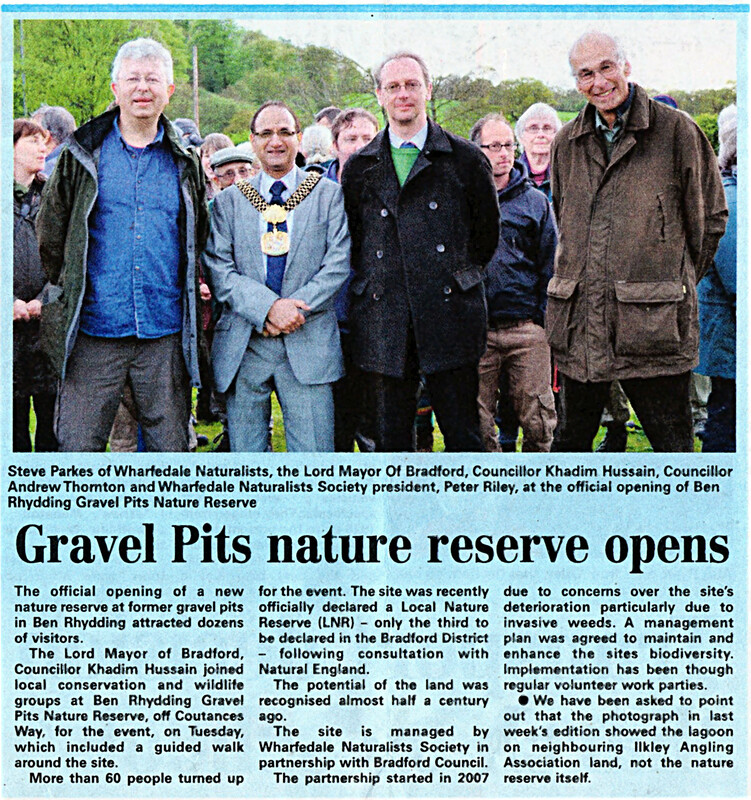 In October 2013 working with the support of Natural England the site was declared a Local Nature Reserve. This is only the 3rd LNR in the Bradford District – the 2nd being the nearby Sun Lane reserve in Burley. Note – the SEGI Citation also covers neighbouring land owned by Ilkley Anglers this also formed part of the original gravel pits. WNS also work with the Anglers to help manage the biodiversity of their site which is of a very similar nature.